Moving to Fashion Valley, California. Yes, Please! Explaining this neck of the woods to someone who’s never been to San Diego is interesting because few places on earth are this clean, sunny, and full of 25-40-year-olds. Usually, young people gravitate toward cities like Chicago or New York, but if mild weather and career opportunities are in the cards for you, this is a great choice in California. Trendy, modern, and on-point while being regal at the same time! Fashion Valley is your first-class ticket to a life of luxury shopping. If you can’t make your bed on a runway in NYC or Milan, this has to be the next best thing. Absorbed by the larger Mission Valley, Fashion Valley is the hottest place to live in San Diego right now...and we’re not talking temperatures! Checking out amenities and average monthly rent for condos will tell you all you need to know about the lives of local millennials. 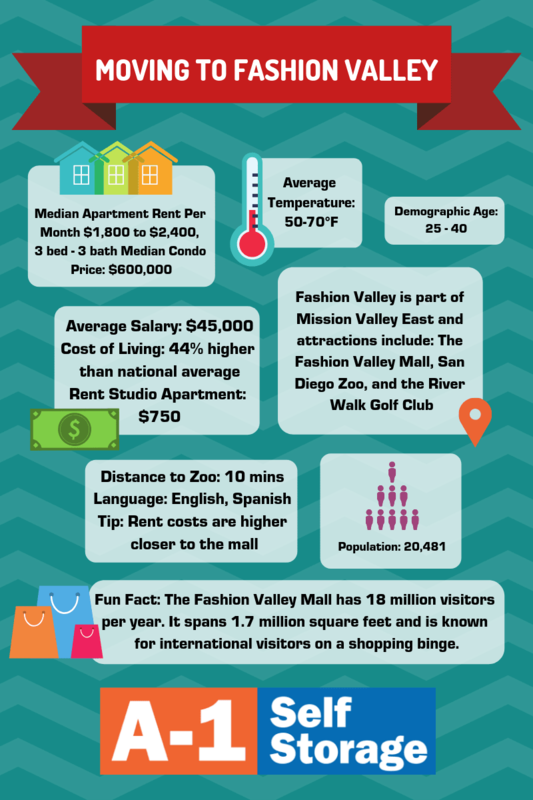 The closer you are to Fashion Valley Mall, which has more than 18 million visitors a year, the higher your expenses. If busy and diverse is what you’re dreaming of, let’s check it out and see how we could make this happen! Here at A-1 Self Storage in Fashion Valley, we know “Momma needs a new pair of shoes”, so let’s see what it’s going to take for you to have it all! What matters most to you? Is it being close enough to walk to over 200 international fashion houses like Hermes? Or do you enjoy the taste of a chic, signature eatery? If so, Fashion Terrace Apartments is a budget-friendly fit. Rental costs are between $1800 and $2400 per month. As a bonus with this property (if you can snag one), you get a two-bedroom apartment where you can have your family canine live with you and enjoy the lap pool. Keep in mind this property is posh, but there are indeed some other options that will blow your mind in terms of elegance. Head South West toward the beach and the prices of condos and apartments for sale are likely to increase. In this part of California, there is a sweet balance. Mission Valley has some 3-bedroom 3-bath condos and townhouses for a minimum price tag of $600,000. Keep in mind with that purchase you can enjoy an on-site security team and top-of-the-line fitness equipment! It’s a community lifestyle in these condos. Having window treatments already installed when you move in can be a serious perk in a town like Mission Valley. So, with that in mind, you could consider some of these properties quite a deal. One of my favorite discoveries is Hanover Mission Gorge, this property features unique oversized outdoor fireplaces. Imagine sitting on beautiful, brand new furniture discussing the day's events with a drink in hand. The amenities alone scream luxury. Oh, and it gets even better! Not only can you lease a space to live in, but you can utilize space for your business as well. Before you know it, you’ll be cooking in your gourmet kitchen, while handling business calls by the pool. A 3-bedroom unit will have you dishing out $3287 per month, but get a couple of young professional roomies and you could be living the dream. Rodeo Drive this is not, however, Fashion Valley Mall measures 1.7 million square feet and is known for international visitors on a shopping binge. Often times entertainment is the last line item on our budgets, but here in the valley, you may want to move it up on the list. Nothing is worse than living in a happening area full of amazing shopping and tons of things to do, but not being able to afford it. There is a movie theater within walking distance of many rentals, and who can resist a blockbuster? Something to keep in mind when there is a bar inside the theater like McMuffins. The reviews on this place are sweet. Just $10-12 for cocktails and you can bring your drink right along in with you if you’re over 21. Holla! While we’re on entertainment, is there anyone left on the planet who has NOT heard the rave reviews about the San Diego Zoo? There are often lines just to take a photo in front of the sign! It’s a memory maker for many residents and just 15 minutes from Fashion Valley. Whether it’s competitive golf, adventurous hiking, or historical sites; you’ll find yourself in Mission Valley enjoying outdoor activities year round. Again, keeping entertainment in your budget is super vital to the quality of life in this bustling city. Fine dining is a sport in San Diego and if you can wiggle it into your plan to eat out at least once a week, you’ll have the world’s offering of cuisine. Mexican fare on open-air patios are a favorite in Old Town, and new to the valley are restaurants such as North Italia operated by former ‘Top Chef’ Rich Sweeney. This restaurant features large windows and bright red pops of color that make you just want to sit down and eat linguini with marinara sauce. You know this area is up late when the restaurants don’t even close until 11 pm. Fashion Valley has been known for decades for its club scene. What’s great about looking back at the history of this area is that it’s always been “right on” when it comes to being on top of the latest club trends. The Gaslamp Quarter is where you’ll find FLUXX, Oxford Social Club and some serious lights and sounds of California. Shopping may have worn out your pocketbook, but your dance moves now need working out! This is where the party is at. So get out your GUCCI and let’s do this! As far as getting you home, transportation in and around Fashion Valley is a breeze. The valley serves as a crossroads for the 8 and 5 and the interchange for the 805. Now, don’t rule out a good walk! The pedestrian pathway along the San Diego riverfront is a whole different feel than the shopping district. The potential for this area has yet to be realized (but is definitely talked about). When this area develops, wow what a bridge it will be from Mission Valley East to Mission Valley West. If you’re headed out and need transportation, the Transit Center offers the blue and green trolley lines in every direction and many bus routes. Tolleys seem to be the go-to for a lot of young professionals who live just far enough away from the office to make walking a bit dangerous with traffic. How can you get to A-1 Self Storage? Oh, that’s easy! From Fashion Valley Mall head north on Avenida Del Rio toward West Fashion Valley, turn right on Friars Road and then left onto Frazee! Young professionals are looking at Fashion Valley as a stop on their journey. According to professionals who work in this district of San Diego, they can easily walk out of their offices and grab some groceries, catch a movie on a 3D screen, or even shop for a couture handbag. If this is something that trips your trigger, let’s get you home to Fashion Valley today. Call or visit the facility to see how A-1 Self Storage can be a part of your move today!